By concerning on every kind of single labels around us I have mostly referred to Beko DSL, yet, there are other akin records as well, definitely enough worth to pay much attention. For instance, the likes of Club 7, Bad Panda, and Eardrums Pop are the names to be rememebered in the first place. In fact, the last named record was previously known by its sizable indie pop compilations (13 compilations in total), having acquired a kind of magnificient quality the better you are hardly able to find out from somewhere else (indeed, your obligation is just to listen to those ones!). However, the last notches of its discography are exclusively the matter of singles, having a geographical stretch from Indonesia to The United Kingdom, from Finland to the United States. By stilistical approach it might be compared to the sounds of the legendary The Slumberland Records, and The Best Kept Secrets. Indeed, mellow indie pop, consisting of jangle pop and twee pop shadows, yet, having a nowadays touch via poptronic elements. 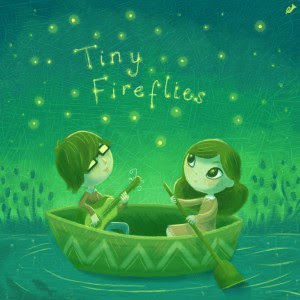 The Fireflies`s 3-tracks single set is the first missive, signifying the departure from the array of compilations. A duo (Leslie and Kristine) comes from Chicago, having been sharing their duties at Very Truly Yours, and proceeding their solo projects (Tiny Microphone; Fireflies) as well. One of those beatific tracks is a cover of Skeeter Davis` hit The End Of The World, inspired by Claude Longinet`s interpretation of it, and another (Holding Pattern) exploits a sample by Serge Gainsbourg`s La Horse. As it is said yet, it sounds really beatific reminiscent of chillwave oozings and sighs, getting quite close to Memoryhouse (Kristine`s hyper dreamy timbre and vocal manner turns/ascents tend to be similar to Denise Nouvion). On the other hand, a kind of slow(core) movement with the help of drum machines and cathedral-alike organs conveys a decent cue toward Beach House, though. Or hinting at the beautiful coverprint (by Minkee) could have it be named as "lovewave" instead of? A great music, no doubt.